Avoid Long Distance Running at the Brunswick Rotary Club's Patriots' Day Half-K on April 15th! 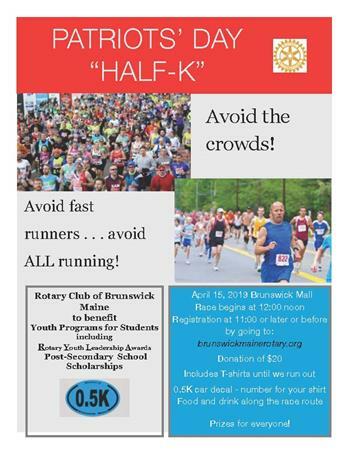 The Brunswick Rotary Club will be holding it's first ever Patriots' Day Half-K on Monday, April 15th on the Brunswick Mall. Registration starts at 11:00am while the "race" begins at noon. 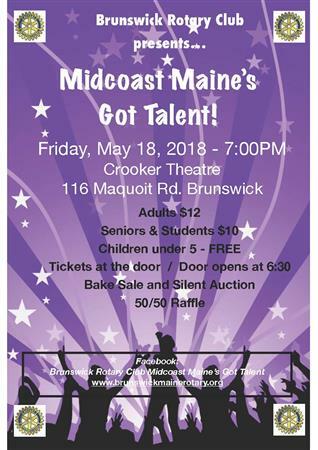 The Brunswick Rotary Club is proud to sponsor Midcoast Maine's Got Talent for the eight year. 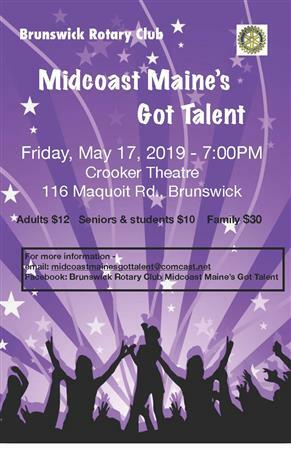 The talent show will be held on Friday, May 17, 2019 at 7:00pm in Brunswick High School's Crooker Theatre and will feature 20 acts. 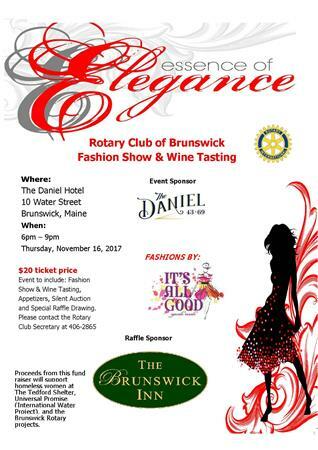 The Brunswick Rotary Club is sponsoring its second annual Essence of Elegance Fashion Show & Wine Tasting on November 15, 2018 from 6:00pm - 9:00pm at the Hilton Garden Inn at 5 Park Street in Freeport, Maine. The Rotary Club of Brunswick has been awarded a $5000 grant to purchase nine laptop computers, mouses and a securable computer charging cabinet for the Brunswick Teen Center. This competitively awarded Rotary District 7780 grant was approved mid-July and awarded based on its quality and positive community impact. 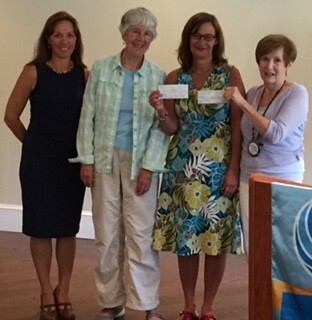 The $5000 check was presented to Jordan Cardone, Teen Center Director, and Stacy Frizzle, Executive Director of People Plus/Teen Center during the August 20 Rotary meeting. A following ceremony at The Teen Center unveiled the new computers to the delight of the teens. Save the Date (11.15.18) for our Fashion Show Fundraiser! 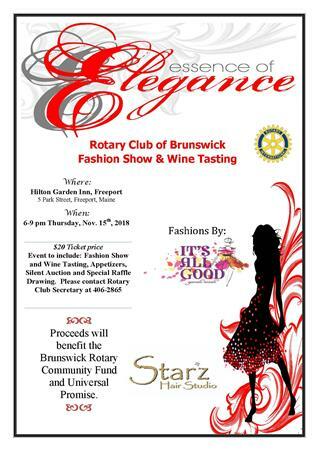 Brunswick Rotary is excited to announce the second annual fashion show and wine tasting fundraiser will be held on Thursday, November 15th at the Hilton Garden Inn in Freeport from 6:00pm - 9:00pm. Buy a Reusable Hannaford Bag & Support the Brunswick Rotary Community Fund! The Brunswick Hannaford Supermarket located has chosen Brunswick Rotary Club as a beneficiary of the Hannaford Helps Reusable Bag Program! 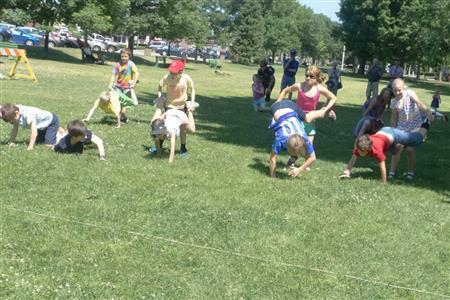 The Rotary Club of Brunswick, in cooperation with the Brunswick Parks and Recreation department, is pleased to announce “Games on the Mall,” a Brunswick Fourth of July tradition, will take place from 10:00am to 11:30 a.m. at the Brunswick Town Mall on Maine Street. 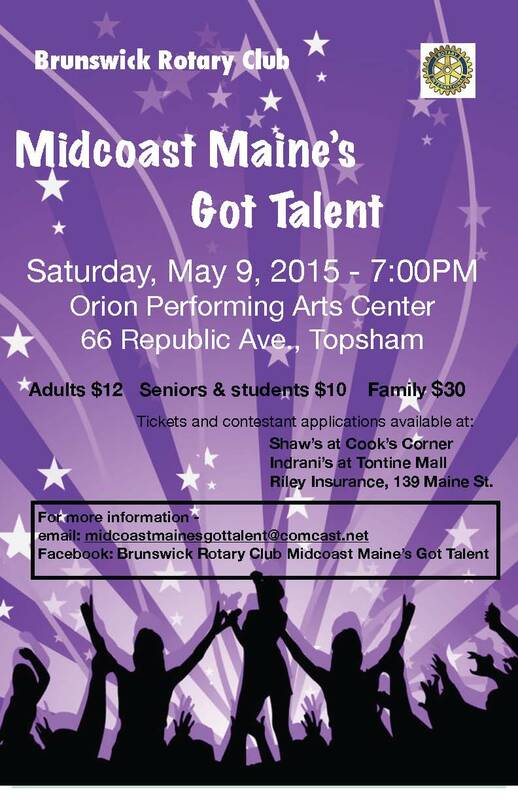 The Rotary Club of Brunswick is now accepting applications for “Midcoast Maine’s Got Talent! 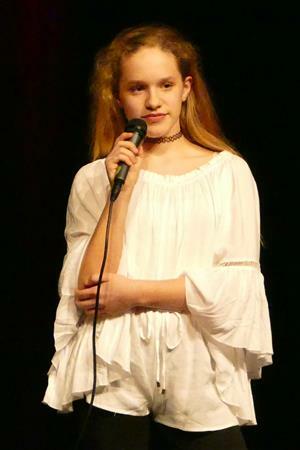 2018.” The seventh year of this fun and well-attended local talent show will be held on May 18th, at 7 p.m., at the Crooker Theatre in Brunswick. Deadline for applications is April 16th. Great weather and a great turnout for the 2016 4th of July games on the Mall in downtown Brunswick, Maine. 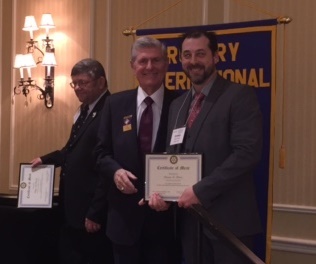 On February 24, 2015, Dennis St Pierre, a member of the Rotary Club of Brunswick, Maine, was presented with a merit award by our District Governor Larry Furbish, at the World Understanding and Peace Dinner in South Portland. The guest speaker at this dinner was Rick King, International Rotary President for 2001-2002. It was absolutely fascinating hearing him tell his story about how Rotary has made a difference in his life, and in the World! The crowd was completely silent as we listened to his compelling words. It made me so proud to be a Rotarian! 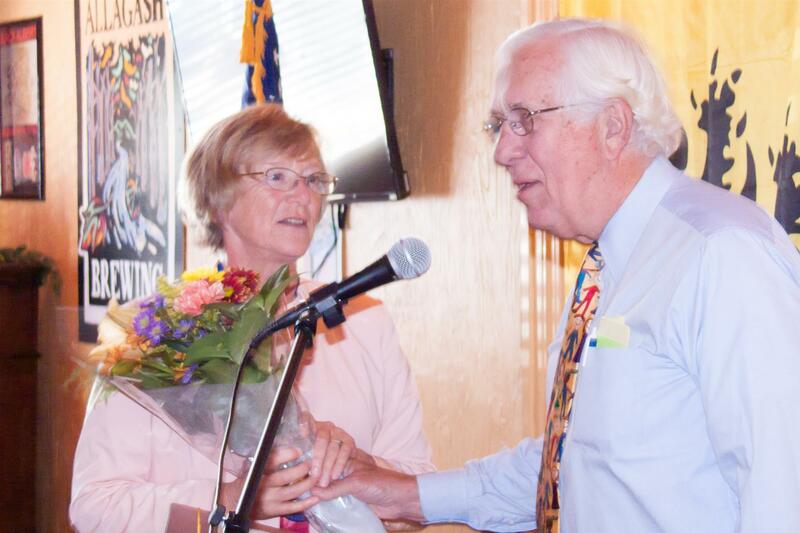 Dennis was honored as an outstanding “new” Rotarian who has stepped up and understood what being a Rotarian is all about. Dennis has taken on significant responsibility in his short tenure, and has made a great impact to our club. His passion for helping people, his energy and his creative mind are the traits that set him apart. Please join me in congratulating Dennis on this great honor! Every Monday morning, over a thousand students in the greater-Brunswick area arrive at school hungry. They leave school on Friday afternoon and simply don’t have enough food at home to provide the nutrition they need on the weekend. It affects their ability to concentrate. It affects their ability to learn. It affects their ability to do all the things many others take for granted. It doesn’t have to be this way. For around $5 a week, we can supply a student and their family with enough food to get through the weekend so they don’t go hungry. 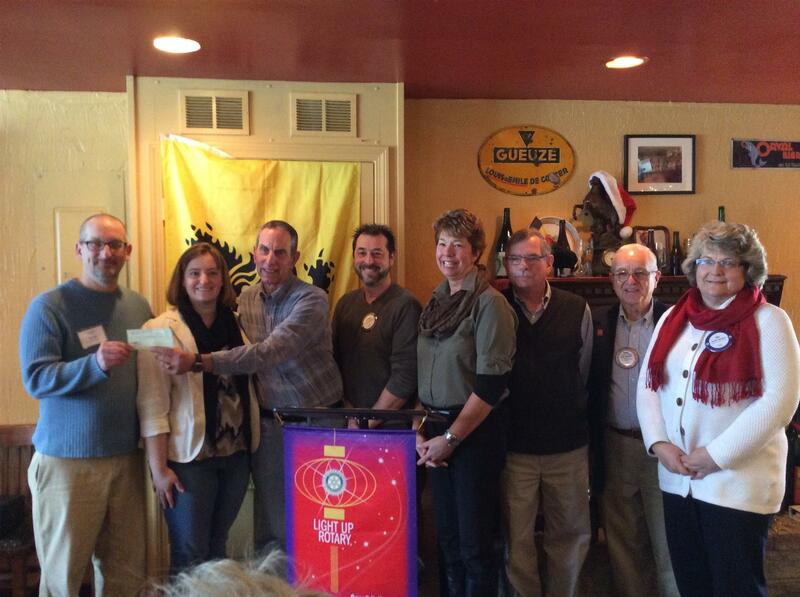 The Rotary Club presentation is in addition to a $1000 check presented previously. 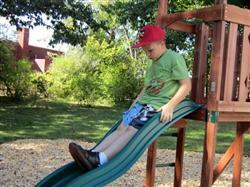 The money was raised primarily through a Pack a Back Pack 4ME event in October. The genesis of this project came from a visit to a Brunswick Rotary Club meeting last March from Lonnie Hackett, a Bowdoin College senior. While Lonnie was a student at Bowdoin College, he had an opportunity to travel to Zambia during summer break in 2011 to teach English and math. While there, he noticed an alarming gap in his students’ knowledge of basic health care including common and preventable childhood diseases, sanitation, and HIV/AIDS education and prevention. Lonnie traveled to rural Nepal in the summer of 2012 where he observed a school-based healthcare model that he believed could be modified to fit the vulnerable children in the N’Gombe district of Lusaka, where the poorest children live and attend school. During his senior year as a biochemistry major, Lonnie garnered the knowledge of any global health expert who would listen to his goal of establishing a program to train teachers as health care providers within the 50-public schools that serve children who suffer from treatable diseases. He established “Healthy Kids/ Brighter Future” to bring medical services and health education to children in need. Rotary International is one of the largest not-for-profit service organizations in the world, with approximately 1.6 million members actively participating in thousands of local clubs spread across 161 countries around the world. Rotary International Foundation contributes nearly $100 million every year toward humanitarian programs in which Rotary members participate and voluntarily raise funds. 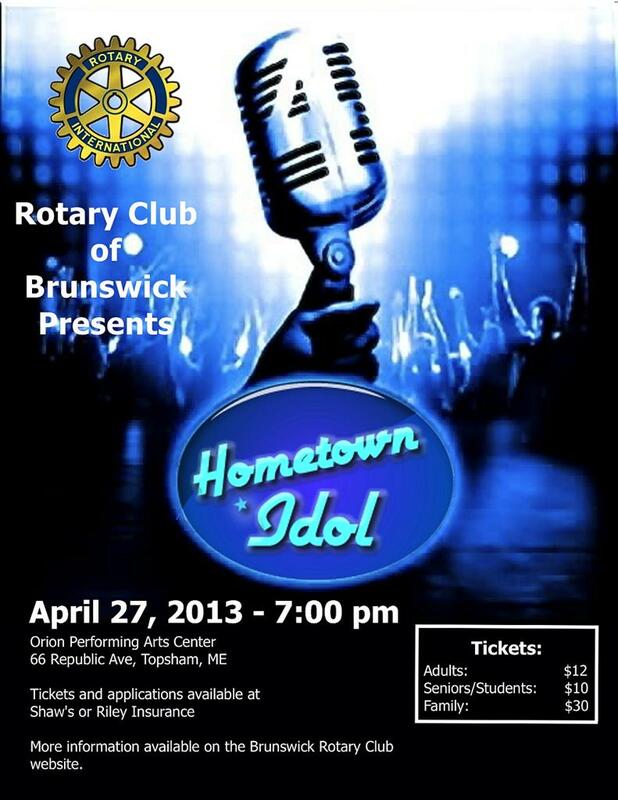 The Rotary Club of Brunswick was chartered in 1925 and currently has an active membership of 70 community leaders. They meet weekly, except on holidays, at noon on Monday in Brunswick. 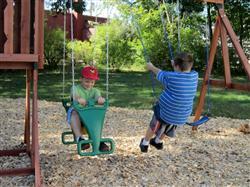 For more information, visit: www.brunswickmainerotary.org or www.healthykidsbrighterfuture.org. 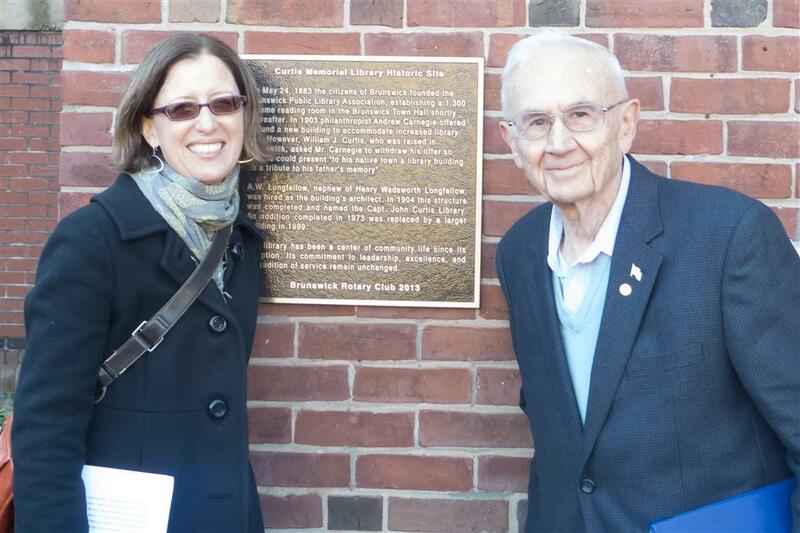 Kate Egan, president of the Curtis Memorial Library Board of Directors, and Brunswick Rotarian and retired US Navy Captain Charles "Chuck" Mull, stand in front of a bronze plaque marking the 130 year old library as a historic site. The Brunswick Pride and Heritage Committee of the Rotary Club of Brunswick sponsored the plaque's creation and dedication, honoring the library that began in 1883 as a single room at the town hall with a collection of 1300 books. 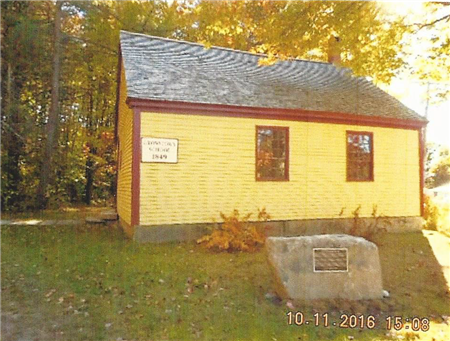 The current library location opened in 1904 and is the 13th location honored by the Brunswick Pride and Heritage Committee. 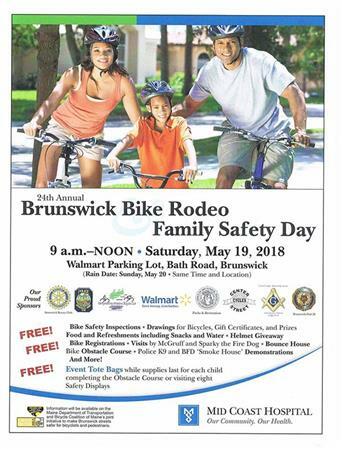 For a full listing, click on the Brunswick Pride and Hertiage link. 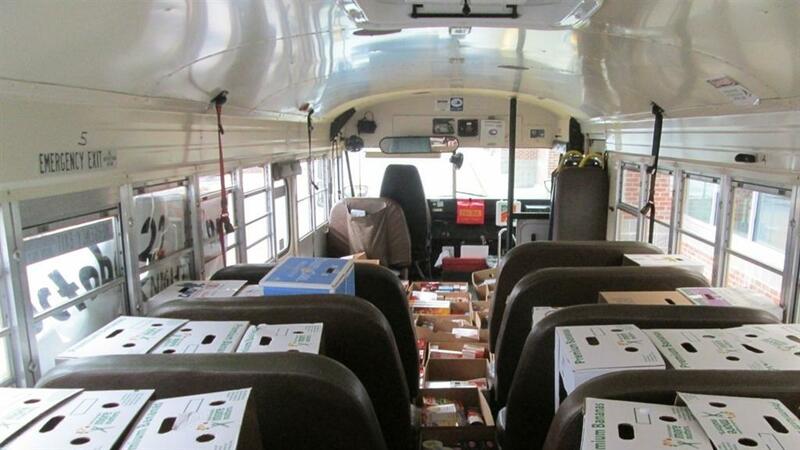 As you can see from the photo the food drive Saturday February 23 was a HUGE success! Over a ton of food was collected for MidCoast Hunger Prevention Program as well as $310.00 in cash. Thank you to everyone who spent time at Shaw's on Saturday and to everyone who made a donation to help feed those who's plates are empty. We are Rotarians and we do make a difference! 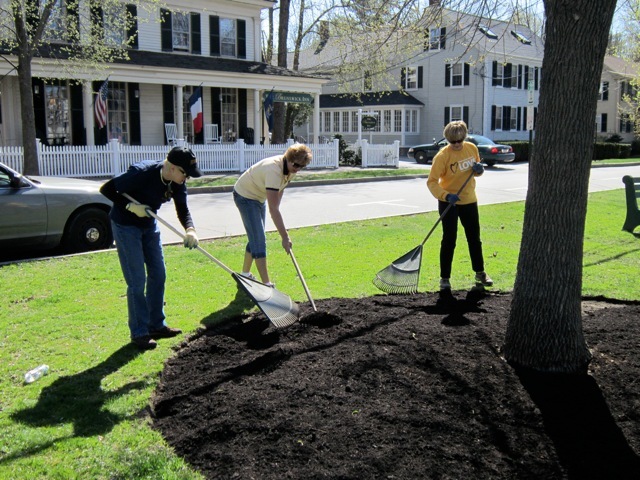 sprucing up the appearance of the centerpiece of our town. Saturday, June 11 marked the dedication of the Rotary Club of Brunswick's plaque recognizing Holbrook Wharf as a unique and historical location in the MidCoast of Maine. The Brunswick Pride Committee of the Rotary Club have been identifying and recognizing those places that make our Midcoast area special and unique since 2000, and this is the 10th location to be so honored. In the photo, President Sue Chadima (left) endures the rain during the dedication ceremonies. Brunswick Rotarians Connie Hartley and Carol Taylor enjoy a moment at the 19th hole of the Big Brother Big Sister golf tournament this summer. Lauren Kennedy and Stacia Brezinski, both seniors at Brunswick High School were honored recently by the Brunswick Rotary, for their "diligence and persistence in community service". 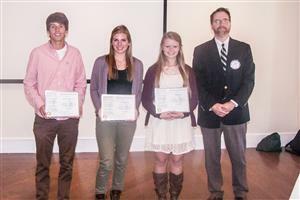 Rotary Club representative Valerie Campbell noted that both students exemplify Rotary's commitment to service above self. Brezinski was described by her guidance counselor Mike Halmo a great choice for this recognition. She is involved in the Youth Advocacy Group, Gay Straight ALliance, The Theatre project, Midcoast Chapter of the American Red Cross, to name a few. Kennedy is also exemplary in her community involvement. She volunteers at Mid Coast Hospital, the Coastal Humane Society, Big Brothers/Big Sisters, and Curtis Memorial LIbrary, and has spent countless hours working as a mentor for a an underpriveleged youth. Both Students were also selected as one of 40 students to train with the Center for Preventing Hate. As student leaders their role is to raise awareness on how to prevent hate and violence in their school and community. Brunswick resident Emily Marsh spoke at our August 23, 2010 meeting about her exchange student experiences in South America.